Home Finance 401k My 401k with John Hancock is…Closed? 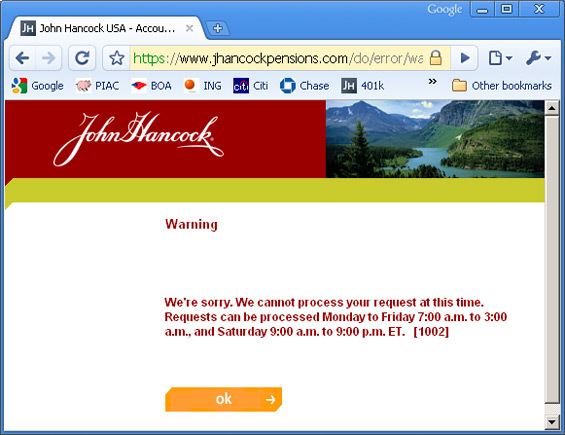 My 401k with John Hancock is…Closed? While I don’t really have any complaints about John Hancock in general, I do have a problem with their website. See, the website is supposed to benefit the customers and account holders — that’s its sole purpose! So instead of waiting three months for an already outdated statement to arrive via snail mail, I can just log in and see what’s going on right NOW. Really, that’s why most businesses have set up websites. On the web, they can serve their customers even when they’re not open! It’s pretty simple. This is where the problem lies with John Hancock. Their website is not open round-the-clock. Their website works, well, sorta like an online version of the often envied bankers’ hours. That, my friends, is not convenient. I’ve ran into this before with a couple of sites as well. I agree it’s not convenient and it makes no sense. OK – now that is absolutely insane. Why would any company work like that? Well they are wasting their resources on an IT department, aren’t they? Don’t ever do any business with John Honcock! Imagine being charged over 1% for a money market account that would barely give you 2%! This is their least fee! It’s a high way robbery company that sells annuities and NOT mutual fund shares! Whatever you buy is called ‘unit’ and not ‘share’ and each unit cost more than a share plus the fees! And when you try to take YOUR money out, they would charge you more coz you are taking their lifeline away!